There are a lot more nice models in 2009 line-up, and the Minis made it in the 1st batch in the new wave with the new packaging. The Mini Van is one of the hit items besides the Civic Type R, the classic is my all time favorite. Surprise me the Mini doesn't fit with the normal standard wheels but the disc wheels. 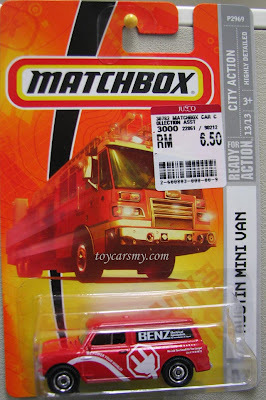 This is not the usual type we see on the most Matchbox. 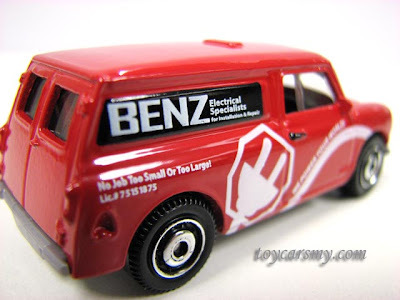 Don't fooled by the "Benz" word, it is not Mercedes but dummy tampo for Electrical Specialist. 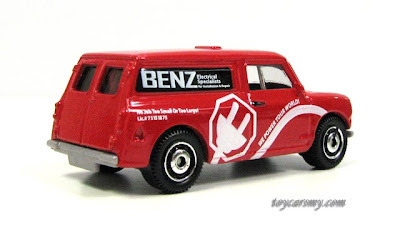 Verdict: Mini, all time favorite collectible model. I Like: It is my favorite. 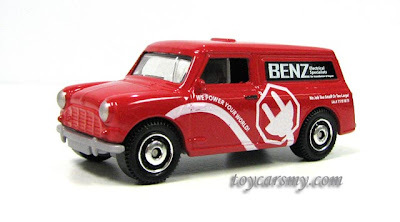 I Dislike: Missing detail for back lights (can add myself), and the meaningless Benz tampo.